Stephen Kellert is Professor Emeritus at Yale University and one of the more prominent academics promoting the biophilic or nature-inspired design agenda in the world today. This 2015 paper, written with US-based architect Elisabeth Calabrese, serves as a pithy overview of the key tenets of the design ethos that has inspired our own Biofit fitness studio concept. The full article is available online here. If we try to apply that same wide-angle view to our environment we see that what we now think of as our ‘natural’ habitat is essentially a series of indoor or covered spaces, be it home, office, gym or restaurant, interspersed with short walks that connect one to the other. Many of us now spend around 90% of our lives indoors resulting in a fundamental disconnect with nature. In more concrete terms, Kellert and Calabrese equate that to a lack of natural light, ventilation, materials, vegetation, natural shapes and forms, all things that we took for granted in the past. How is this negatively impacting our lives? What damage is it doing us as a race or perhaps more urgently, to the planet? These are big, hairy questions that are outside the scope of an article on architecture and design but any comprehensive answer would widen the frame of reference in order to look at the more general 21st century malaise that includes Big Agriculture, global warming, Type 2 diabetes and the obesity epidemic, amongst other things. Here though Kellert and Calabrese use the evolutionary argument outlined above, as favored by the paleo and primal communities, leaning on the overwhelming weight of macro history to establish the primacy and importance of our connection with the natural world before moving on to what really interests them, their proposed design solution. Biophilic design is their chosen response to this disconnection with nature. Far from being a regressive philosophy that asks us all to go off-grid for the rest of our days however, it is about finding a new harmony between contemporary existence and man's relationship with the natural world. Kellert and Calabrese offer a summary of the key elements in biophilic design that can be loosely categorized as ‘actual nature’, ‘almost nature’ and ‘inspired by nature’. Of those, we would highlight four points in particular as being of particular relevance to our concept for a biophilic urban fitness studio. Firstly, natural light is fundamental to wellbeing as it facilitates a connection to our daily circadian rhythm as well as the seasons. When operating in the northern hemisphere, training before and after dark is a necessary evil but low intensity, yellow lighting in a studio rather than white or blue light can counteract those negative effects. Spending time in the presence of abundant vegetation has been shown to reduce stress and enhance both performance and productivity. 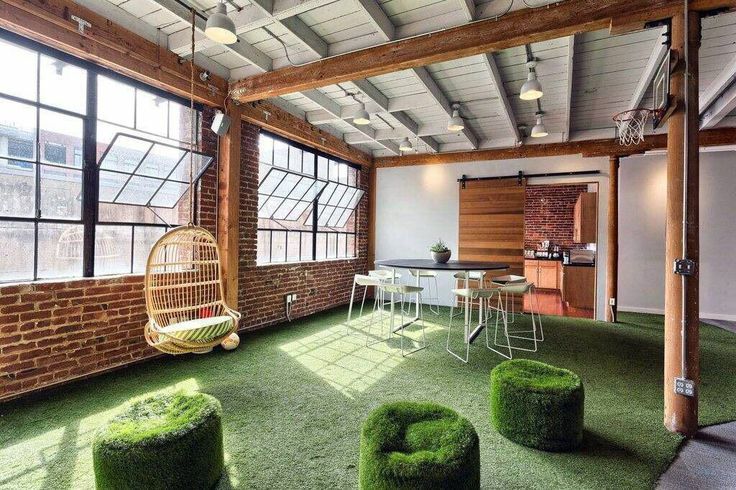 Google, Facebook and Amazon know a good thing when they see one so all of their new headquarters in Silicon Valley have adopted biophilic design principles for this very reason. Even just a 1-2% of additional office productivity in a billion dollar business can make all the difference. A training session in a Biofit biophilic fitness studio therefore represents two benefits in one: a hit of Vitamin N(ature) and an evolution-friendly workout at the same time. Natural materials such as wood, stone, wool, cotton and leather often have both visual and tactile qualities that we instinctively gravitate towards. Compare that with metal and plastic of most gyms and the innate appeal of wabi-sabi (imperfect) organic forms in a fitness studio rather than off the shelf, high-tech machinery makes complete sense. We know which we'd rather work out with. Finally, muted and earthy natural colors give us a palette of beiges, reds, browns and greens to suggest sand, soil, rock, plants and water. Applying this color scheme to a fitness studio takes us away from the bare bones approach of Crossfit studios as well as the currently in vogue nightclub-like studios to produce something more in tune with the environments we evolved in over thousands of years.